What does that mean? It means we are CERTIFIED by our suppiers and offer the highest level of sales after sales service and warranty. We are reputable, Authorised Service, Installation & Sales Agents. We pride ourselves on our loyalty to customers and suppliers - Expect the best from us - after sales service and warranty service is guarnateed. We are Level One Dealers and fully Authorised technical service and installation agents. You can rely on us to offer a 'total solution' for Trailer Boat, NAVnet and Commercial products. Trained and trusted to install and/or repair the products. We are experts in the new technology. Great advice along with great price. If the unit is fitted or installed by us and you encounter a problem we arrange for an authorised service tech to assist on board. Backup after service is GUARANTEED. Wherever your vessel may be. "Be mindul of dealers or installers who are NOT certified installers. You will not get On board support." Furuno products are sold, serviced and installed by Authorised Furuno Dealers, Installers and Service Agents throughout Australia. To help you identify the Dealer that best suits your requirements we have organised our dealers into three tiers based on the level of service offered. 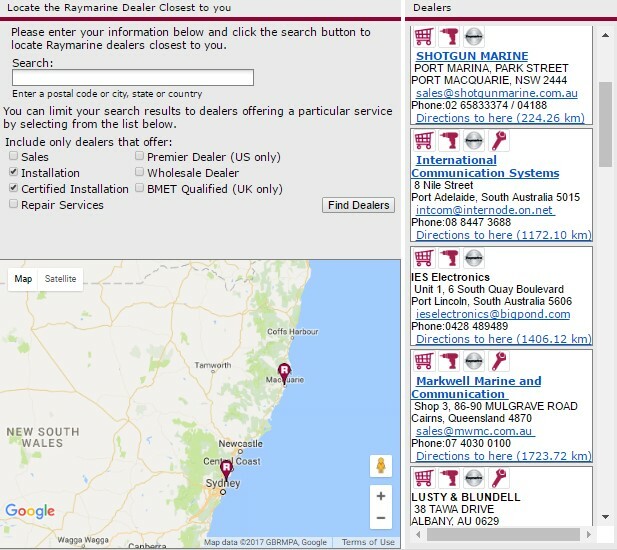 Please select a dealer near you that best suits your needs. The highest level of sales, after sales service and warranty service can be expected from these dealers. Level One Dealers are fully authorised technical service and installation agents. You can rely on these dealers to offer a 'total solution' for Trailer Boat, NAVnet and Commercial products. Level two dealers offer a high level of installation and sales support for the full range of Trailer Boat and NAVnet products. These retail outlets stock the full range of Furuno Trailer Boat products. Choosing to have your system installed by a Simrad Certified Dealer adds 2 Year Onboard Support and 24 Hour Replacement* to your support package. This is available only on systems installed by a Certified Dealer and valued at over US$2500*. 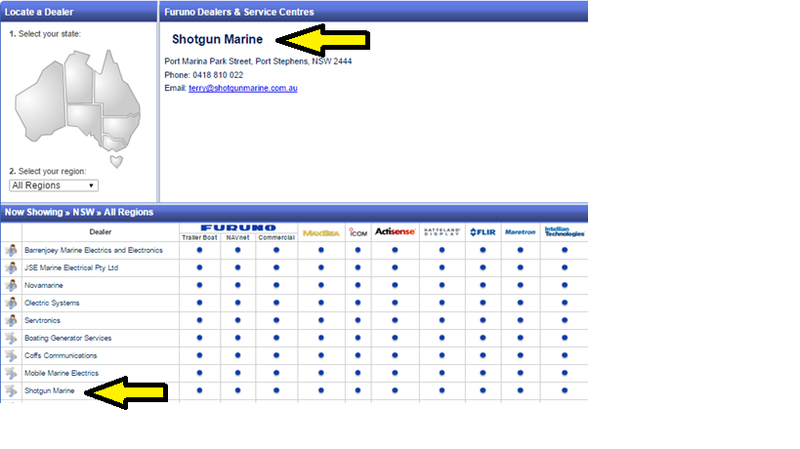 Shotgun Marine Services, Licenced, experienced Marine Electrician based in Port Macquarie. On Call for all marine electrical needs. Established 2003. GPS, Sounders, Autopilots for all your boating needs. Shotgun Marine business based in Port Macquarie on the Mid North Coast of NSW, providing first class services to the marine industry. We offer expert advice, supply, install and service quality marine electrical and marine electronic equipment, from high technology arrangements to individual specific marine products and packages. Committed to providing boat, ship and vessel owners with specific marine electronics. First class, safe, guaranteed marine electrical packages, marine sales, service and repairs. Unlike other Marine electrical suppliers, Shotgun Marine are tradesmen, not salesmen. We understand the needs of each vessel owner and customise, recommend, supply and install Marine electronics. Most importantly our products come with the manufacturers guarantee and personal backup service. We carry out all types of marine electrical repairs with extensive experience in new vessel fit outs and marine electronic system installations. We supply marine electrical sales and service to all vessels commercial and private, large or small. 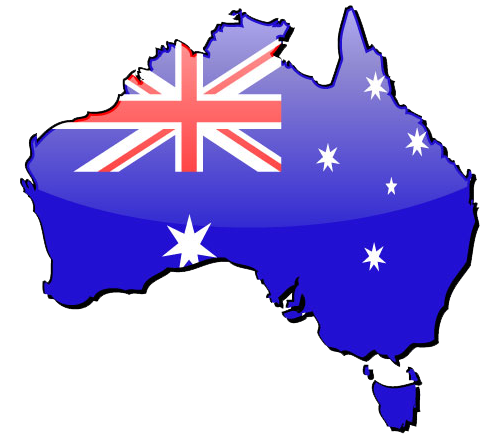 Our experience, rapport, training, certifications are testimonial of our 20 + year long term history and, relationship with clients Australia wide and our suppliers. Shotgun Marine Services Port Macquarie, Coffs Harbour, Forster, Port Stephens, Lake Macquarie, Newcastle and Sydney and Brisbane by appointment. Our Guarantee... We know the products and get you the right marine electronics to suit your navigation and fishing needs. Proud suppliers and the only authorised service agent of marine electronics Raymarine, Simrad, Furuno, Garmin and Lowrance on the Mid North coast. Shotgun marine leading the way in Marine Electrical and Electronics. Specialising in customised marine electronic packages suited to your marine or boating needs. We offer a range of marine electrical services. We specialise in Marine Electronics and Communication equipment. The founder has passion for Game Fishing and the apprentice holding a game fishing world Record. We know our marine electronics having over 20 years of experience in the field. We take pride in ensuring all jobs are carried out with professional results with attention to getting your vessel electrical and electronics systems seaworthy and safe meeting deadlines as required. We are the preferred marine electrician service agent on the mid north coast and do extensive insurance work for all major insurance companies. Our expertise has Marine insurance assessors to count on our reports credited to quality service, expert knowledge and good old fashioned honesty and reliability. We are proud to uphold our reputation as the leading marine electrical and navigational specialists on the coast. We have shipped tailor made marine navigation packages Australia wide. Our buying power allows us to consistently be competitive in the market with pricing and marine electronic bundle packages at the forefront. Shotgun Marine Services is the leading Marine Electrician on the Mid North Coast supplying and installing the majority of major brands ensuring safe and secure navigation and boating. Commercial, government, fishing, trailer boats and large pleasure ships are all catered for by our team of qualified marine electronics technicians who will design, install and commission an electronics system to meet your requirements. On Call services include Coffs Harbour, Foster / Tuncurry, Newcastle, Mid North Coast, North Coast. If you need a marine electrician immediately, give us a call on 0418 810 022.